Recently, I was reminded of the importance of understanding childhood development, and how it applies to social media and digital citizenship. Our children, particularly our adolescents, are heavily engaged in social media during a crucial time of physical, emotional, and mental developmental changes. This translates to potential problems in these areas if they are disrupted by issues on social media. As a teacher, I engage in social media mainly for professional purposes. I am not concerned about identity development, AND my interactions are always quite positive. Until the other day. I experienced my first confrontational messages over social media, and was unfollowed and blocked. He since apologized and deleted his tweets, but this reminded me that though I could put it in its proper place, have a growth mindset and move on, this probably happens a lot more with adolescents due to their developmental stages. This truly made me think deeper about students and social media. What do we know about adolescents? We know that adolescents have not fully developed the parts of their brains that regulate emotion and impulsivity. Further, adolescent minds tend to experience more emotion and the capacity for self-regulation may not be fully developed. We also know that social identity matter a lot to adolescents AND how they ‘appear’ to their peers. What we as teachers do not ‘see’ on social media still affects adolescents very deeply. Therefore, I think we need to go beyond basic digital citizenship, and incorporate the aspects of critical literacy, metacognition, voice & identity – what we already do in our literacy programs. Whether or not students are being bullied, educators still need to incorporate strategies to help our students navigate the virtual world. How will we help to guide our own students who are dealing with stress as it comes from social media – bullying or not. How does this infiltrate into the classroom, learning and teaching? New layers of communication, and dimensions of life at play- yet parents and teachers did not grow up with this reality. 1. Provide explicit feedback for students based on where they are at in their minds – not our minds! This means really getting to know them! 2. Forget the worksheet. 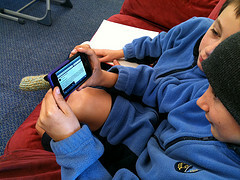 Teach students how to respond online – this is a MAJOR part of our world now! 3. Actively create positive online communities for your students. 5. Help students create meaningful networks on their own. 6. Teach students what to do when faced with negativity online. Be explicit. Give explicit feedback. 9. Help students experience positivity online. That way, when negativity does happen, your students have experience and reminders that they have positive things that they can be proud of. 12. Help students to develop metacognitive strategies. Provide explicit feedback for students based on where they are at in their minds – not our minds! This means really getting to know them! that promote a growth mindset where they can learn from their mistakes, and understand their emotions with regard to the behaviours of others online.